← Beyond Hello, how are you? My work requires me to travel extensively and when things don’t quite go to plan, train and airline staff take the anger of passengers in their stride and as part of their job role as ambassadors of their company. I always wonder what people are trying to achieve when ranting at staff about a train breaking down or as happened recently, a burst water main stopped the rail system for a number of hours. I think HR professionals have to deal with people complaining more than most other professions. If you are a manager who has someone that is always complaining, or they are always going off to HR to put a word in their ear, then I have some good tactics that will help you cope with them. Be strategic with people who complain to you habitually. Their need is to be appreciated, because they can see where the organisation/ department/ management is going wrong and they want you to do something about it. What we need to do, to ensure that they feel appreciated, is to match their need by treating them as a resource. Let’s face it, they will probably have a perspective that requires we take them seriously and by treating them as a resource, we are doing just that. Also, there maybe substance to their complaints that will benefit everyone, including you! Complainers are essentially passive and will prefer complaining to action and solving the problem. Here is a 5 step structure to help you with the complainers in your life. 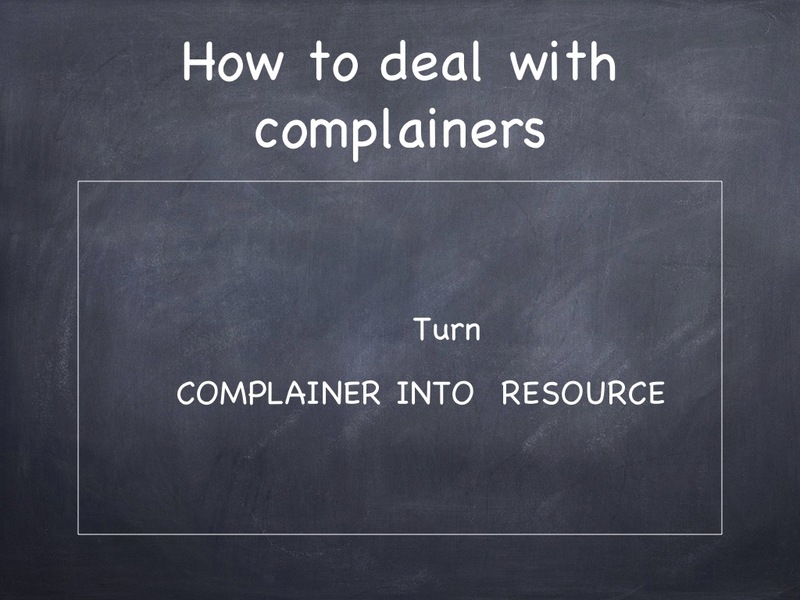 Your goal is to keep the ‘problem’ with the complainer and use them as a resource. One. Listen to their main points. When they start repeating their main points, you should interrupt them, so that you disrupt their flow. Let’s face it, once a complainer gets into their stride, there can be no stopping them! Three. Clarify their main points with them, to ensure that you have listened and understood their main complaints. Four. Ask them what they think should be done about this. Five. Suggest a way forward. Give the problem to them as a project for them to investigate and report back to you. Ask them to note down how often and when this issue happens and report back to you in a week/ month. They are gone, their complaint goes with them. This entry was posted in Change Management, Communication, Leadership, Performance Management, Time Management and tagged Body language, conflict, decision-making, delegation, emotional intelligence, feedback, Teamwork. Bookmark the permalink.